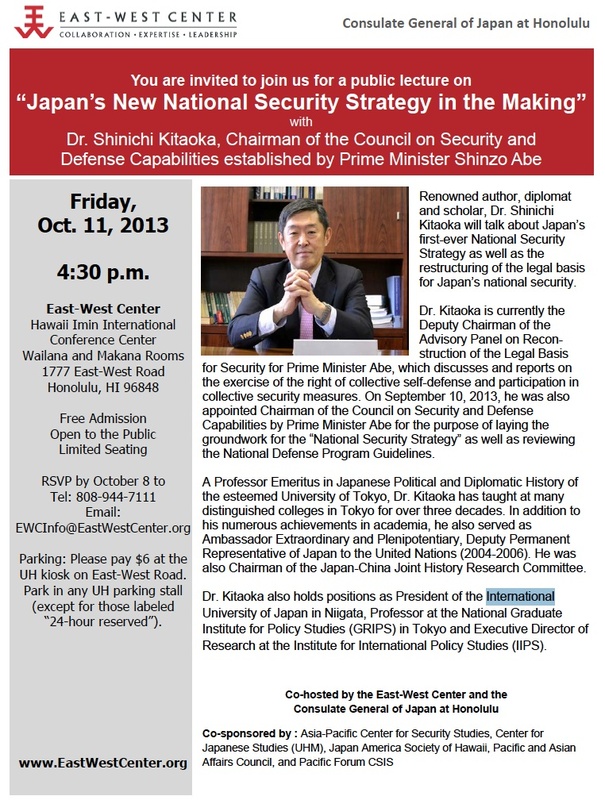 I attended because I wanted to see what was making one of PM Abe’s leading advisors tick. Dr. Kitaoka did not disappoint. There were a couple more surprises in Dr. Kitaoka’s talk. 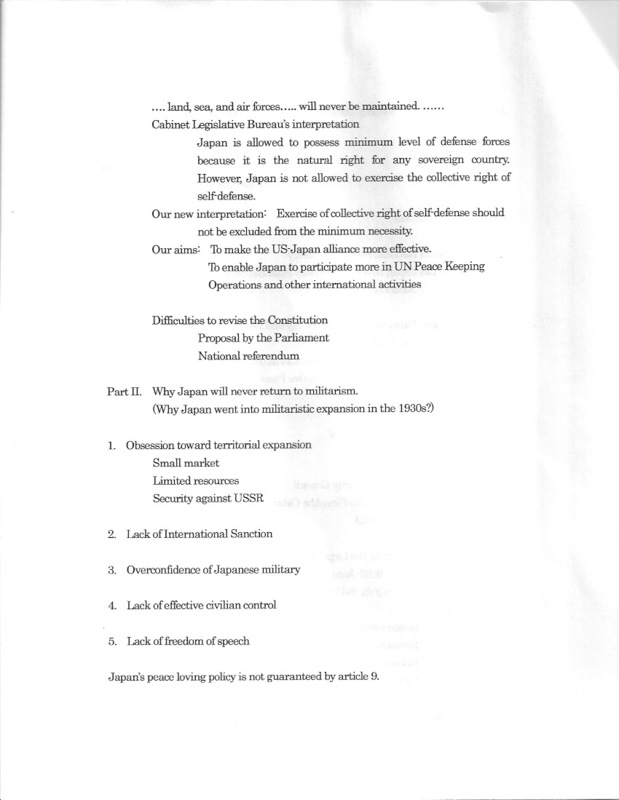 One was that he was arguing that Japan is essentially in the same position today as China was in the early 20th century, where Japan is the one now who should think about how to defend itself from unjustified aggression from China! The other surprise was his reasoning about why the world should not worry about Japan’s potential renewed territorial expansion abroad — because treaty agreements between the US and South Korea would preclude Japan’s need to invade the Korean Peninsula for defensive reasons (now that’s a novel take on Japan’s colonial history!). Oh, and that it would be an impossibility for Japan to go nuclear again, because Japan as a huge developed economy integrated into world markets is particularly vulnerable to international sanctions. But China, you see, is a member of the UN Security Council, unlike Japan, and they make UN sanctions more “ineffective”. Less democratic countries, such as China and Russia, have more power in the UN than the democratic countries such as Japan, Germany, India, and Brazil… (and that was a very neat way to allude to Japan’s need for a UNSC seat — told you he was smooth). The Q&A was done by people passing papers to the front to be sorted, vetted, and read by EWC staff. 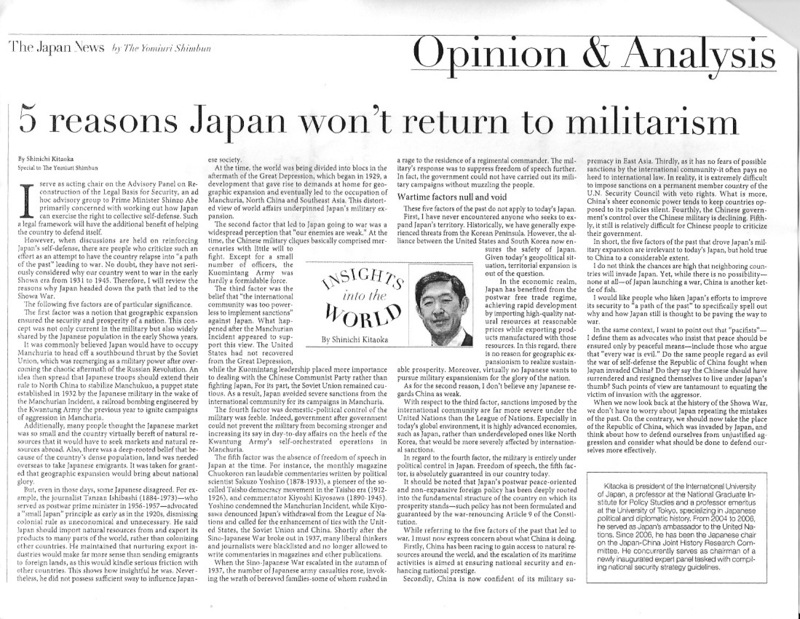 In the end, Dr. Kitaoka talked like I would expect one of Japan’s elites to talk — seeing the world only in terms of power, and how Japan needs more of it because its neighbors are security threats. That’s what any security analyst will say, of course (that’s how they’re trained), but Dr. Kitaoka spoke like a trained Gaijin Handler representing PM Abe’s political agenda, not a scholar. Fascinating in that light, but scary, since these are the people who have been voted right back into power and want to dramatically alter Japan’s future policy. 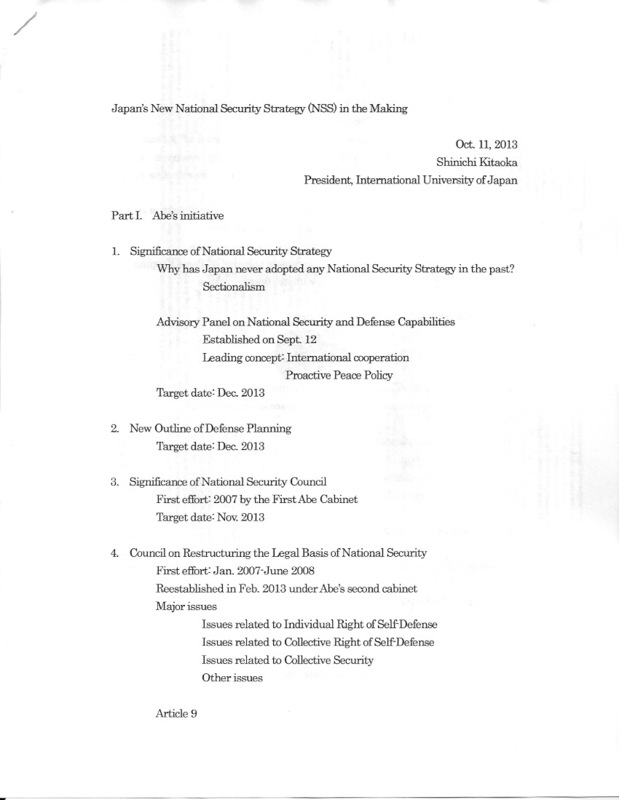 Japan’s New National Security Strategy in the Making from East-West Center on Vimeo. You should watch Slavoj Zizek’s videos on Youtube about Nationalism & Violence. When he talks about Burlusconi’s model of society (popular buffoon leading a country in which the people can enjoy all perversions, but without freedom of social discourse), he could almost be writing the textbook on Abe. It’s very interesting if you watch from a position of knowing who Abe is and what he is up to. It explains that inflation and war are essential ingredients for fascism, and we know that Abe belongs to (even leads some) groups that have policy goals aimed at returning Japanese society to 1930’s values (i.e. fascism). Also very interesting is Zizeks attack on buddhism, in which he singles out buddhism’s role in normalizing Japan’s war-crimes (in the process showing that D. T. Suzuki, though popular in the west, actually was a prime-mover in rationalizing, even inciting the Japanese to commit war-crimes). Many thanks for the precious – and timely – Zizek links. His remarks on the sacred cow D.T. Suzuki are spot on and should be more widely discussed. This speaks volumes of Japan’s self-perception vis-a-vis its nemesis – up to the present day. Well, no wonder then that, as Zizek points out in one of his talks, the Japanese construed their invasion of China as a “merciful” intervention to teach those people some manners and save them from themselves. As Befu observes in his concluding remark, it’s no wonder either that Watsuji’s Fuudo has remained so popular in Japan: “it is constructed on ‘we-philosophy’, which fits the Japanese mode of thinking like hand and glove”. Abe, Kitaoka & Co. would certainly endorse it! The full reference: Befu, Harumi. 2004. “Watsuji Tetsuro’s Ecological Approach: Its Philosophical Foundations”. In Asquith and Kalland (eds. ), Japanese Images of Nature: Cultural Perspectives. London: Routledge. @ DK, Watsuji, Abe, Aso’le and co. just dont get civil disobedience. They are frightened of it, of individual freedoms. Japan could benefit a bit more from e.g. the alleged “chinese evasion of state control” but this is all Pot and Kettle. Lots of crooked Japanese little companies and businessmen (I can say mostly men, in misogynist Japan) ignoring laws like paying health insurance for their NJ workers etc. And what is pachinko? Its gambling. “has no mind for tax burdens imposed by the state”- you mean like those crooked Japanese corporations that have no paid tax in the UK recently? This can be traced back even to Ito Hirobumi. His limited revolution ushered in some change, but a bit like Deng Xiaoping and not like Gorbachev, human rights were never part of it- the Prussian model/German law etc was the order of the day. Ditto the recent official in Japan who said “the people might get the mistaken idea that they govern themselves” (sorry, forget who). Can you really believe that these bluebloods, who inherited their seats, are democrats? Their whole mission since 1955 has been to roll back individual freedoms in favor of citizen obligations to the state. And now they are getting their way. Fascism is linked with corporatism; that is, the subordinance of individuals to large company/state interests. Yes, that sounds like Japan, and it becomes more so with each new item of the Abe agenda.